A novena is a formalized vocal prayer extended over a specific amount of time. When we use this kind of prayer, we align our minds and hearts with the meaning of the words, giving God praise, renewing our faith and trust, asking him for things we need or desire, or all of the above. A good vocal prayer helps us connect with God. It also reinforces our Christian convictions: by giving words to good desires and expressions of love for God, we actually exercise those desires and that love, and when we exercise them they grow. A novena is a vocal prayer, or series of vocal prayers, that you commit to praying over an extended period of time. These prayers are usually linked to a specific devotion (for instance, devotion to a particular saint) or liturgical celebration (a novena for Pentecost, for example). They are also very often linked to a specific intention that we are praying for – you can offer a novena as a way to petition God for a special grace, like the healing of a sick person or the conversion of someone who is far away from God. The words of the novena will reflect all of these factors. They will remind you of the meaning of the liturgical celebration, the virtues of a saint, or the goodness of God. And the combination of prayers will also, usually, give you a place to insert your personal petition. It’s important to remember, however, that novenas are not magic formulas. They are prayers. They are one way we can enter into conversation with God. Why do we pray a Novena? In general, we pray novenas for the same reason that we pray at all: because God deserves our praise, and because we need his grace. Novenas are prayers, and all the benefits that prayer always brings are also brought by novenas. This particular form of prayer, however, has some special characteristics. First, they provide a channel for strong spiritual sentiments or desires. Sometimes, our souls are so full of sorrow, or anxiety, or hope, or thirst for holiness that it is hard for us to find the words to express ourselves. Novenas give us a vehicle for prayerful expression. A novena of prayer can be a powerful way to mourn the loss of a loved one, for example – a novena of Masses can be a beautiful way to commend their soul to God’s mercy. In a crisis, a novena can channel our apprehension in a positive way: entrusting our deeply felt needs to God through the intercession of a saint, for example. Novenas put clear parameters around deep spiritual sentiments, enabling us to have confidence that we are keeping them in harmony with God and his will. In this way, they provide true comfort to our souls; they assure us that we are “doing our part,” so to speak, in response to particular needs of our own or of others. Second, they help us stay in sync with our spiritual family, the Church. By joining in the Novena of the Divine Mercy (from Good Friday to Divine Mercy Sunday), for example, we unite ourselves to millions of other Catholics all over the world who are engaged in the same prayer. 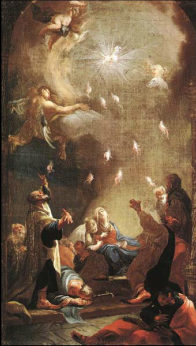 By praying a novena before a major liturgical celebration like Christmas or Pentecost, we can prepare our souls to engage in that celebration more fruitfully, less superficially.